Many NVIDIA graphics cards support multiple performance levels so that the PC can save power when full graphics performance is not required. These modes can include different GPU/memory clocks for the Windows Desktop (idle), video playback, and 3D applications. To provide end users with more control over the power management capabilities of the graphics card, NVIDIA has added an option to the control panel to allow users to set preferences for how the driver will switch between these performance levels. The default behavior in R190 drivers ("Adaptive") is for the graphics card to monitor GPU usage and seamlessly switch between modes based on the performance demands of the application. This allows the GPU to always use the minimum amount of power required to run a given application, and can allow even older 3D games to run in lower power modes if the game does not require full 3D performance. This mode is recommended by NVIDIA for best overall balance of power and performance. An alternate option is now available in the NVIDIA Control Panel that allows users to maintain the card at its maximum performance level when 3D applications are running regardless of GPU usage. 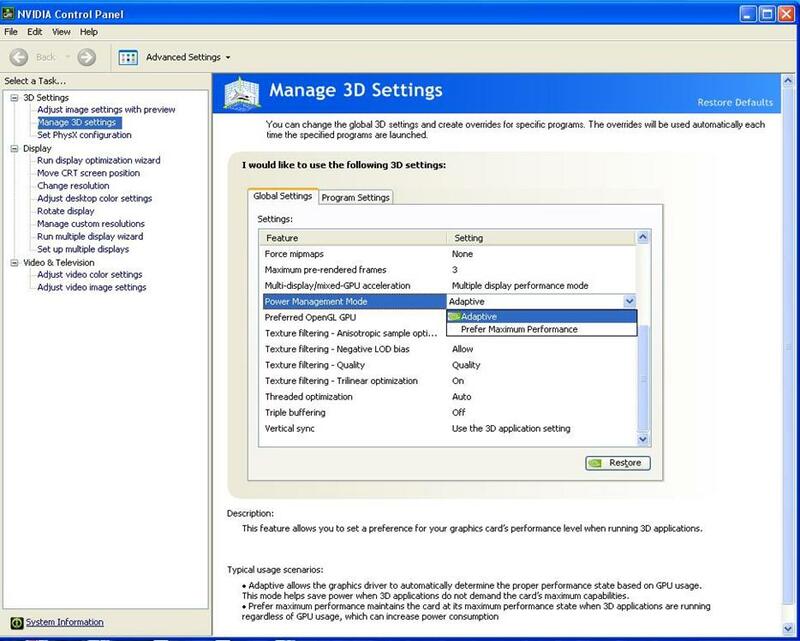 To set this option, users can open the NVIDIA Control Panel and select "Prefer Maximum Performance" from the drop down menu under Manage 3D Settings à Power Management Mode. This option can be set Globally (for all 3D applications), or an application profile can be created under Program Settings to set the preference for a particular 3D application. This feature is available only on select GeForce 9 Series and above GPUs that support multiple performance levels (idle, 3D, etc) and applies only to DirectX and OpenGL-based applications running under Windows Vista and above.